The Asylum for Orphan Boys was established in Liverpool in 1850 at the suggestion of the businessman and philanthropist Mr Harmood Banner, to run in parallel with the Female Orphan Asylum founded a decade earlier. As had happened with the girls' establishment, boys were initially accommodated in a rented property while fund-raising and construction work took place to provide permanent premises. The new boys' Asylum, to house up to 160 inmates, was erected close to the girls' premises on Myrtle Street and followed a similar design. Its foundation stone was laid on October 5th, 1852, by the Mayor of Liverpool. On the same occasion, a foundation stone was laid by the Bishop of Chester for a church to serve the two institutions and placed directly between them. The location of the buildings is shown on the 1891 map below. Orphan Asylums site, Liverpool, c.1891. The boys' Asylum was formally opened on March 13th, 1854, with the church, named the Church of the Holy Innocents, also being consecrated. The building of the church, which could seat 700, was entirely funded by Harmood Banner and included a stained glass window of 'Christ blessing the little children' costing £250. The children from the Asylums sat in a special gallery, the boys on one side, the girls on the other. Admission to the Asylum was limited to those born within seven miles of the Liverpool Exchange, and aged 7 to 11 years at their date of entry. No boys were admitted from workhouses. Applicants were required to provide certificates of their birth, baptism, and of the marriage and death of their parents. 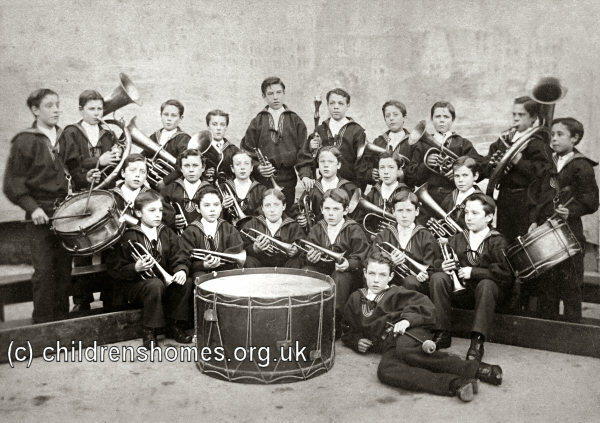 As well as their classroom and religious education, the boys could take part in the Asylum's wind band. The picture below is believed to show the band in the 1890s. By the 1890s, the inmates were making use of the swimming bath at Lodge Lane. On finally leaving the Asylum, the boys' generally entered employment with local tradesmen. In 1913, all three Asylums were placed under a single management and became the Liverpool Orphan Asylum, renamed the Liverpool Orphanage in 1925. At around this date, consideration began to be given to relocating the Orphanage away from the city centre. A fund-raising campaign was launched and in 1930 a Great Fair was held in aid of the appeal. The site for a new building was located on Woolton Road, in the Childwall area of Liverpool, and the new Liverpool Orphanage premises were opened in the summer of 1934. The Myrtle Street buildings no longer survive. Liverpool Archives, 3rd Floor, Central Library, William Brown Street, L3 8EW. Holdings include: Annual reports (1844-1913, some missing); Admission registers (1866-1924); Admission papers and certificates (1850-1924); Case files; Accounts (from 1858); Minutes (from 1861); Correspondence (from 1856); Boys' Asylum Journal (1897-1921).